A virtual guide to the German Federal State of Rhineland Palatinate. Beside a state profile, this page offers links to sources that provide you with information about this "Bundesland", e.g. : official web sites, local news, culture, history, education, city- and country guides with travel and visitors information, tourist attractions, events and much more. Other Cities: Frankenthal, Idar-Oberstein, Kaiserslautern, Koblenz (Coblenz), Landau, Ludwigshafen, Neustadt (Weinstrafle), Pirmasens, Speyer (Spires), Trier, Worms, and Zweibrücken. Religions: 24.8% Protestants, 64.7% Roman Catholic, 7.2% no religious affiliation. Industries: Tourism, wine, chemical industry. 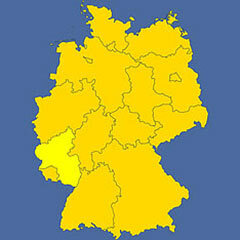 The state is located in central south-west of Germany. The state offers idyllic river landscapes in a mountainous country, historical cities and villages and some of the best wine-producing areas in Germany. Rhineland-Palatinate shares international borders with France, Luxembourg and Belgium, it borders the German federal states of North Rhine-Westphalia in north, Hesse in east and Baden-Württemberg in south-east, it surrounds the federal state of Saarland. Official Rheinland-Pfalz (in German only). Celebration site for 60 years of Rhineland Palatinate since its foundation in 1946. Rhineland Palatinate's state office for statistics (in German). Searchable map and satellite view of the capital of Rheinland Palatinate. Searchable map and satellite view of Rhineland Palatinate. National news and for the region Rhein Main, Mainz; online service of Allgemeine Zeitung, Wiesbadener Tageblatt, Wiesbadener Kurier, Wormser Zeitung. Regional public radio and television. National public television channel based in Mainz.. The Hambach Castle where the Hambacher Fest“ (Hambach Festival) took place in the end of May in 1832, a demonstration for freedom and unity of Germany. The Imperial Cathedrals on the Rhine in the cities of Mainz, Speyer, and Worms. Imperial Cathedral of Speyer, largest Romanesque church, burial site of 8 German emperors and kings. Mariendom (Cathedral of St. Mary and St. Steven), the Imperial Cathedral of Speyer. The smallest of the three Imperial Cathedrals on the Rhine. Trier Cathedral and Church of Our Lady, oldest Bishop's Church in Germany, the seat of the Bishop of Trier since 1 700 years. With its state collection of prehistorical items and folklore art. Famous for its collection of paintings of modern art of the 20th century. One of the oldest museums of print-art in the world, it is dedicated to the inventor of printing, Johannes Gensfleisch zur Laden zum Gutenberg, born in Mainz. One of the oldest museums of Germany, shows its important collection of art and cultural history. Largest Museum of Natural History in Rhineland Palatinate. The Historical Museum of the Palatinate with permanent exhibitions showing the history and development of the Palatinate. Shows a collection of archaeology and arts of the city of Trier. The German Philharmonic Orchestra Rhineland-Palatinate. Zum Wohl. Die Pfalz. - Pfalzwein, e.V. Information on wines and the wine-growing-country of Palatinate. The Travel Guide to Frankfurt-Hahn Airport (HHN), Germany's Ryanair hub. Discover Rheinland-Pfalz: accommodation, hotels, attractions, festivals, events, tourist boards, tours and much more. Travel guide to Rhineland-Palatinate's seven holiday regions. A tourist guide to Ahr, Rhein, Eifel, Bad Neuenahr-Ahrweiler (in German only). A tourist guide to the Eifel region (in German only). Reisen durch den Hunsrück (in German only). A tourist guide to the Nahe Region. A tourist guide to the Mosel, Saar and Ruwer Region (in German only). Das Portal für Ihren Urlaub in der Pfalz (in German only). Rheinhessen Info portal (in German only). A guide to the UNESCO World Heritage site of the Upper Middle Rhine Valley Mittelrhein-Lahn, Lahntal and Tal der Loreley (in German only). Westerwald tourist information (in German only). Tourism information for the Southern Wine Route. The State Capital, official web site of the city of Mainz. The German Capital of Gemstone Industry. Home to the Football team 1. FC Kaiserslautern. The city is the principal seat of the Mosel and Rhenish wine trade. One of the many stops on the German wine road (Deutsche Weinstrasse). Formerly, the Imperial City of Speyer. One o the oldest City in Germany, beside Trier. The former capital of the duchy of Zweibrücken. A landscape conservation area within the Rheinisches Schiefergebirge (Rhenish Slate Mountains). The UNESCO recognized natural park and biosphere reserve Pfälzerwald (in German). Natural Park Saar-Hunsrück in Rhineland-Palatinate and Saarland. A guide to nature and national parks in Germany. The federal state of Rhineland-Palatinate was established on 30 August 1946. It was formed from the northern part of the French Occupation Zone, which included parts of Bavaria (the Rhenish Palatinate), the southern parts of the Prussian Rhine Province, parts of the Prussian Province of Nassau, and parts of Rheinhessen on the western banks of the Rhine; the new state was legally confirmed by referendum on 18 May 1947. The History of Rhineland-Palatinate, describes the history not only of Rhineland-Palatinate, but of several lineal states located along the middle Rhine River. Wikipedia entry about the Palatinate region and its history. Wikipedia entry about the history of the Rhine Province a former province of Prussia.